There Shall Be No Tracing Before Its Time! Before you start madly tracing that photo of that shiny new router from Cisco, you should first try to find a vector-based file. Sometimes manufacturers provide these resources in the form of SVG, AI, WMF, EPS, DWG, DXF, PDF files. If you find one, hopefully you’ll be able to successfully and cleanly import the vectors into Visio. Here’s a quick list of the techniques we use to trace images. If you’re already quite handy with Visio, this might be enough to get you off and running! 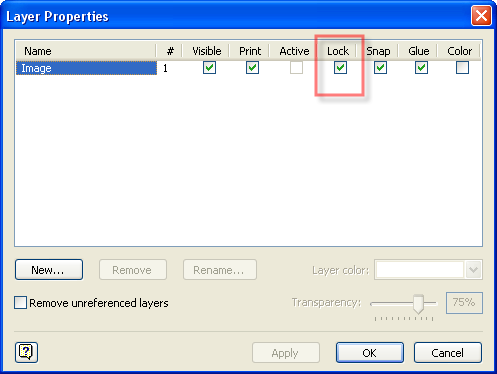 The Snap & Glue toolbar has a lot of options that deal with snapping and gluing. I find that gluing isn’t as important as snapping-in fact gluing might actually get in the way of your workflow. But you’ll certainly want to snap to guides and the lines and vertices that you create while tracing your image! 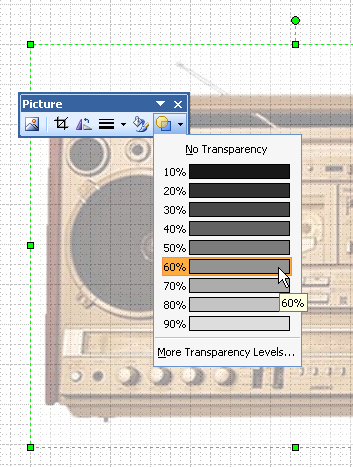 We want to import our image, and fade it so that we can better see our tracing. And so that we don’t keep accidentally selecting and moving the image, we want to lock it down. First the obvious: import the image. This is accomplished via Insert > Picture > From File…, or you can click the Insert Picture button on the Picture toolbar. This is pretty standard Microsoft Office stuff. Stretch the image to be as big as the page and badda bing, badda boom, you’re done! 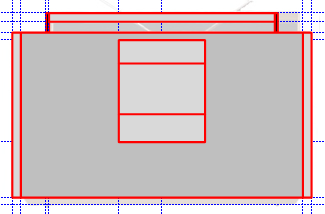 One thing that can be hard to keep track of when tracing is: What features have I already traced? If you draw black lines over black features, this will definitely be hard to determine. Our image is still a free-standing shape on the page. But I promise you, every time we go to select a vertex, or a line that we’ve drawn, we’ll miss and select the image instead! And since we’ll be flying along, we won’t notice that we’ve picked the image, and we’ll move it, or delete it, or God-knows-what. 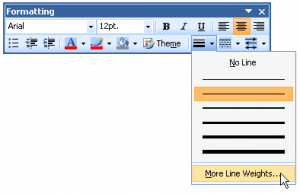 We can control the default formatting of any lines or shapes that we draw on the page. It’s best to set this up before we start drawing, instead of re-formatting after we’ve drawn something. Okay. Thin, colored, no fill. Cool! But how do we set the default formatting in the first place? 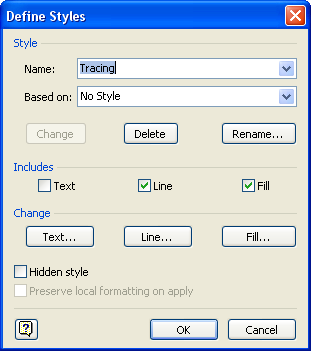 You can, however set default line, fill and text styles, for a drawing. Styles are remembered from session to session. With no shapes selected, you choose default styles from the menu: Format > Style. You might like drawing shapes that fit nicely to the grid or rulers. Yes, I know it’s very satisfying to get that crisp snapping feeling, and to know that all your shapes have nice, rounded numbers. Wherever there is horizontal or vertical symmetry, you should place vertical or horizontal guides to mark the center point. By doing this, you only have to draw half of many of the details on your shape. You can then mirror a duplicate of them later, and quickly be done. 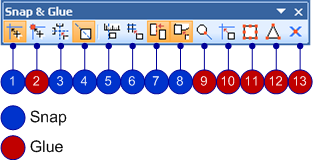 It also ensures consistency, because you are using the same sizes and spacing on both sides of your reflecting axis. I just mentioned that you can piece shapes and line segments together using the Join operation under the Shape > Operations menu. That menu is full of useful functions that you might find yourself using in your tracing endeavors. Of particular interest are the Boolean Operations: Union, Combine, Fragment, Intersect and Subtract. These allow you to slice and piece-together shapes. Combine is useful in making your shapes more efficient. You can combine paths together to make a single Visio shape with multiple geometries. This is similar to creating a group, except that there isn’t really an Un-combine function: it is less reversible, so to speak. But combined shapes are more efficient than groups-there’s less overhead and your shapes will be smaller in size. Shapes that have the same line style and fill color can be combined. 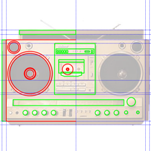 As an example, the knobs and buttons at the bottom of our boom box shape are prime candidates for combination. Several circles and rectangles could be combined into a single shape. Below the Boolean operations are two functions that are used for open-paths: Join and Trim. Join allows you to meld end-to-end line segments into a single path: Trim allows you to cut lines into pieces where they intersect. Once you’ve traced, combined, trimmed, joined and mirrored all the details that you wish to have, you can re-style the shapes to look more like the actual piece of equipment. Change the line colors to something more tasteful. Varying shades of gray, and gradient fills can make the plastic and metal surfaces look more realistic. When you’re all done, group the shapes together, then resize it. If you’re going to use the shape in a scaled environment, then copy the shape to a scaled drawing page-a page that has a scale that is close to that in which the shape is intended to be used. Then resize the shape so that it matches its real-world physical dimensions. 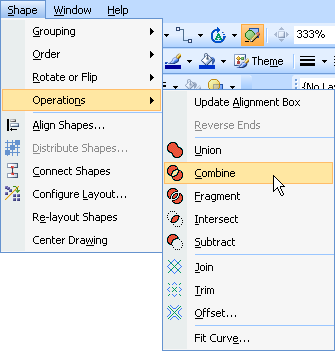 Check out the article: How Big Is My Shape to see all the ways that you can get and set the size of Visio shapes. Before we say good-bye to this article, we’d like to toss in a few more tidbits that are related to the business of drawing in Visio, tracing, and creating manufacturer equipment shapes. If the image you are tracing has lots of concentric circles or “concentric” rectangles and ellipses, then check out this article: Center-sizing Smart Shapes. It has shapes that you can download that make creating lots of centered shapes easier. We’ve talked about keyboard shortcuts in a previous Visio Guy post (see: Work Faster With Our Top Visio Keyboard Shortcuts) but for Professional Tracers (trumpet fanfare!) like ourselves there’s a few more that will definitely come in handy, and a few the bear repeating. This article was mainly concerned with tips on how you can more quickly trace an image. But once you’ve got the vectors down, you’ll probably have some text to deal with. I have come to the conclusion that Glue settings serve also als Snap settings. I haven’t found this clearly explained in the Help. This toolbar is allready sufficiently awkward, so extra confusion because of a wrong tooltip is not wellcome. 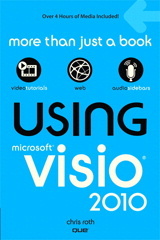 Another criticism on Visio (2003). If “drawing aids” on the toolbar button and “shape extensions” in Tools, Snap and Glue, Advanced are the same, why are two descriptions used. ? All very confusing to me. It seems that the Snap to Drawing Aids toolbar button maps to the Drawing Aids checkbox on the Tools > Snap & Glue > General tab. But this same tab also has Snap to Shape Extensions checkbox! And then, as you said, there are the detailed settings on the Tools > Snap & Glue > Advanced tab! After a little bit of investigating, I realized that there are two things to worry about: the thing you are drawing, and the thing it might be snapping to. 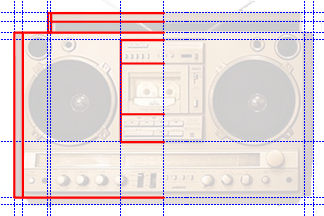 So if you are drawing or editing a line, the drawing aids will suggest vertical, horizontal, 45-degree lines, etc. If Snap To Shape Extensions is also active, then you will get drawing aids for other shapes as well. The separate check boxes allow you to decide if you want extensions for the shape you are editing and/or extensions for other shapes that you are drawing to. This is not super-clear, thanks for pointing this out! Hi, I have a question regarding styles. 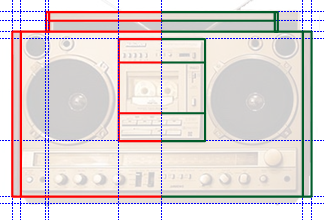 I am using Visio 2003 Professional and would like the ability to redefine a style, preview it and then have the option to change it again if it’s not quite right. I know there is a Change button on the Define Styles window, but only the first change made is actually applied in my drawing. Help seems to imply that you should be able to redefine your style as many times as you like, as does the fact that the Change button is still enabled. I’ve spent several hours trying to find an answer, but it seems no one else has ever wanted this feature… Thanks for your help! Wow! I think you’ve found a bug! I’ve never seen this before, but even in Visio 2007, after the first time you press “Change” in the Define Styles dialog, the drawing doesn’t update. When you click Close, the drawing does however update with your style changes. So the functionality is working properly, but the preview-on-change is broken. 1)Import a DWG to use a background for tracing. 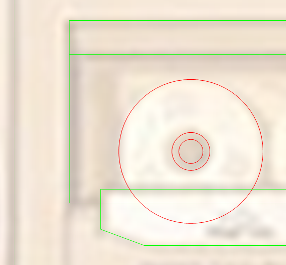 2)Proper settings so as to trace the EXACT image. 3. Remove the background page. 4. Align all the shapes on the grid. 5. Select corners, change lines and infill to suit. This will generally produce a recognizable facsimile which is good enough for figures used in documents and keeps the file size down. When shrinking this to fit inside a document keep text out of the circles and squares as the text is not infinitely scalable.